Hello, and welcome to what we hope will be the first in a multi-topical section on the program known as MultiSIM. I am Bruce Coscia, one of the instructors at CIE/World College. I am pleased to be the moderator for these sections, and hope that you will find them informative. In this article, we are going to explore the most fundamental and yet one of the more important pieces of test equipment, the multimeter. More specifically, we are going to look at the use of the multimeter to measure the resistance of non-linear devices such as diodes. This technique can be used for all types of semiconductor devices, but we are going to use the simplest one first. If we take the multimeter from the default and connect it to the diode (Figure 1), the connection looks very simple; after all, we are only using one component. 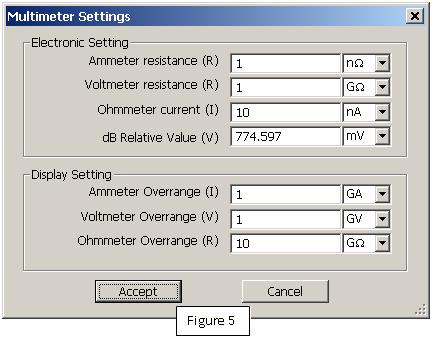 Under normal circumstances, the resistance for any component is measured by just placing the meter as we have done here. The measurement we get, however, is not correct. Since this is showing a forward biased diode, the resistance should be low. 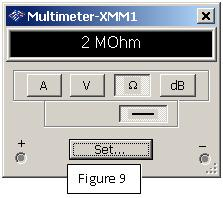 But if we look at the meter reading (Figure 2), we can see there is an issue. The low resistance we are expecting is simply not there. Reversing the diode (Figure 3) should give us a high reading, but yields a very similar resistance value as the forward biased diode (Figure 4). This seems to fly in the face of convention, and gives one pause. If we cannot count on the basic components to function, how can we expect anything to work in real life? The values appear to be something like we would expect if we were measuring leakage current. But that is not possible, is it? Shouldn’t at least one of these diode connections be considered forward biased? Our dilemma is simple; the default settings in the multimeter are the issue. If we take a look at them closely (Figure 5), we can see that the current supplied on the resistance setting is extremely low. As you can see, the current being supplied by default is 10nA; certainly more than adequate for a static resistance, but not nearly enough for our non-linear device. Does this mean we cannot measure the non-linear device? Certainly not! 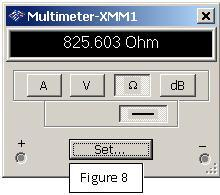 We will have to adjust the current in theohmmeter to make this work the way we want though. The only problem is how much is enough and how do we know? If we think back to the lessons on the forward biased diode, they typically would conduct at about 500µA. Now granted, we could use a higher value to guarantee the conduction, but since this is using a simulation where everything is perfect, we shall use the lowest possible current for our example. In case you are not sure how to change the settings, we shall go through the process quickly. When you call up any component or device, there are ways we can change them to somewhat match the considerations of the “real world.” If you mouse over the component you want, and then click on it once with theleft mouse, it will be highlighted by a blue outline box. When you now right click over the selected item, you will get a menu similar to Figure 6. Choose Properties, and it will give you the same screen as Figures 3 or 4. 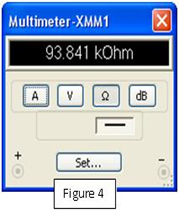 You will then need to click on the Set button to get the screen of Figure 5. You could double click on the meter as well, but be aware that unlike a component, you again need to go one step further by clicking on the Set button to get to the Properties of the meter. Once you are in the Properties screen, it is simply a matter of changing the value of the desired setting to the value we want (Figure 7). 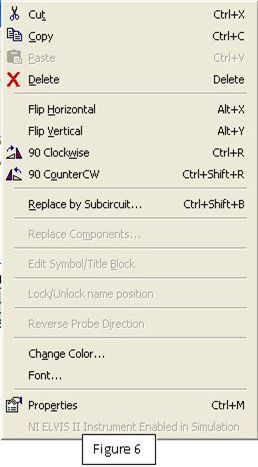 As a note of interest, the shortcut key listed on the menu of Figure 6 shows the CTRL+M shortcut, which would be used if we did not have the menu active. The underline of the e indicates that SHIFT+E will yield the same screen. This shows that just like in any other computer application, there is more than one way to get to the result desired. Once we have set the meter current delivered during the resistance test (Figure 7), we will then re-measure the resistance of the non-linear device and compare the results. To keep life simple, we shall follow the same circuit setup and configuration as seen in Figure 1. This way we are comparing apples to apples, instead of apples to oranges. If we follow the same process, we can be sure the measurements and/or calculations will be met with less confusion. This time when we place the meter across the diode as in Figure 1, we get a reading that is consistent with the known characteristics of the component (Figure 8). This reading is much lower than we previously measured, and does indeed bring us back to reality. Now when we reconnect the circuit as in Figure 2, the meter reading is much higher than the first, and does confirm the fact that a reverse biased diode should show a high resistance (Figure 9). While this is by no means the definitive answer (changing the current will change the resistance), it does show that we can get the expected tendencies if we modify the conditions. Try experimenting with the value of the current to see how the changes occur. For example, if we increase the current we can expect the forward biased resistance to decrease even more (remembering the diode resistance is inverse the current flow by Ohm’s Law). What will happen to the reverse consideration though? It does make for some interesting dinner table talk (Well, then again, maybe not. Unless, of course, it just so happens that your family is very much interested in what you’re learning…). Think about it for a bit, and then give it a try. I guarantee it will be worth the effort. This does mark the end of this particular article. Did what you read help any? Is this forum something you would like to see more of? Have something that might cause you some consternation? What about suggestions for future topics? Please feel free to chime in on these or any other questions regarding MultiSIM. I would appreciate the feedback, and any suggestions for topics or questions submitted will be given creator credit (unless you prefer being anonymous).